As Florida Trend set out to identify the 500 most influential Floridians, we knew we needed a way to organize our thinking. We decided to start with the categories used by the Bureau of Economic Analysis of the U.S. Department of Commerce. We also developed some rules of thumb: No elected officials, no more than three people from any one firm. weight in other parts of Florida. We also decided we’d have a Living Legends category – not counted against the final 500 – that includes people of enduring influence, some of whom are more active than others. Making the final choices wasn’t easy… but given our approach, the guidelines we adhered to, we are proud of the list. Due to the sheer size of Florida and the complicated calculus of “influence,” we are sure that opinions on some of our selections will vary. If you feel we left out obvious choices, or erred in others, let us know. We look forward to hearing from you. We are currently accepting recommendations for the 2019 Florida 500 issue. To share an influential business leader recommendation with the editorial staff of Florida Trend – please compete and submit the information below. All recommendations will be viewed and considered, but final selection will be made by Florida Trend’s executive editorial team. The 500 executives are selected based on extensive contacts in regional business circles, multiple interviews, months of research, culminating in a highly selective biographical guide to the people who really run Florida. 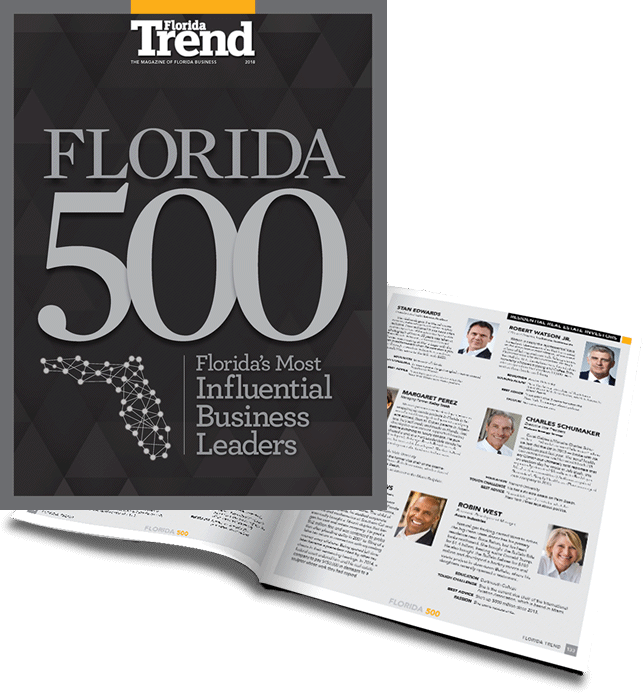 Unprecedented in scope, the Florida 500 is the product of year-long research initiative by the editors of Florida Trend resulting in a personal, engaging look at the state’s most influential business leaders across major industries.